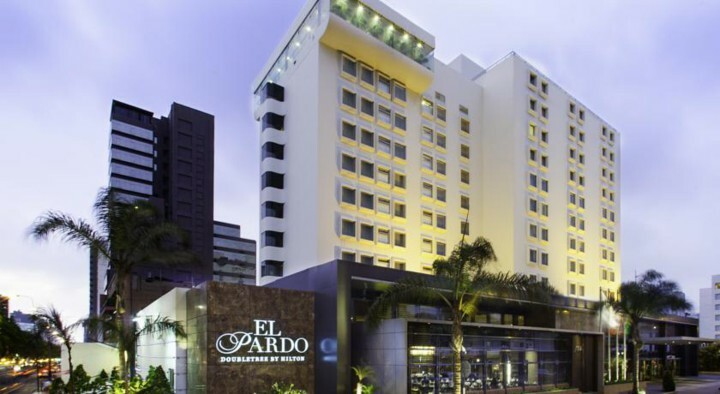 Five-star DoubleTree El Pardo Hotel is ideally located in the chic area of Miraflores, near the most important financial and commercial centers of the city, with easy access from Jorge Chavez International Airport, and to shopping areas, fine dining, entertainment and nightlife. The hotel has eleven stories with 110 rooms and suites offering all the comforts and facilities required by the modern traveler. Completely remodeled in 2013, guests enjoy freshly renovated, well-appointed rooms and suites, renowned personal service, and friendly attention. Rates include complimentary wireless high-speed internet access in all guest rooms and public areas. The warm, traditional décor is complimented by an impressive private collection of Peruvian modern and antique paintings displayed throughout the hotel. Suites include a Jacuzzi and/or Finnish sauna. Hotel amenities include: Indoor swimming pool and Jacuzzi on the 11th floor with panoramic view of Miraflores, 24-hour emergency medical assistance, laundry service, gift shop, three private parking lots, business center, meeting rooms, restaurant, bar, room service, money exchange, gym, and sauna. Room amenities include: Air-conditioning, heating, minibar, color television, internet access, and room Jacuzzi..